I didn’t design our old Red Vengeance game (that was a Sariego joint) or even work on it much, but I did get to re-work its playing pieces into our Red Victory expansion set for Defiant Russia. After expanding Defiant Russia into the Player’s Edition, it seemed a natural next step. Red Victory uses the pieces from our old Red Vengeance game, 40 new ones and a few pieces from Defiant Russia to bring the 1944-45 campaign in the East to the Defiant Russia map. 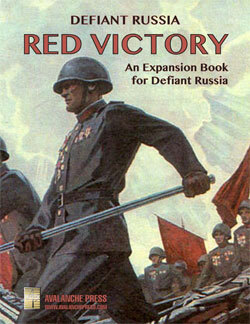 We could have, and possibly should have, issued Red Victory as a complete new game and simply used the Defiant Russia base map with some modifications. Instead, it comes with a book (including the rules), pieces and full-color player aid cards (much like those in Defiant Russia); you’ll need Defiant Russia in order to play it. The old Red Vengeance game had a map running from Tallinn in Estonia on the north edge to Sofia, Bulgaria in the south. It went a little past Berlin on the west, and a little past Kiev in the east. The map artist went for what he called a retro look; I never liked it much. I had purposely laid out the new map for Defiant Russia to cover all of the areas needed for a 1944-45 game, and thanks to geography and geometry it includes a little more besides. There’s Turkey along the southern edge of the map, and in the Balkans the map extends to Greece, Albania, the Adriatic Sea and a sliver of Italy. On the northern edge we have southern Finland, plus much of Sweden. I thought long and hard about how to include Sweden in Red Victory, because Sweden. The Swedes actually did plan to intervene at the very end of the war in a planned operation to liberate Copenhagen before the Germans could commit more atrocities there, but that’s barely on the game map. War involving Sweden would need a little more map at the northern edge, and would have to take place at an earlier date. So I wouldn’t be using the upper left corner, but there was still the top center. Finland was an active theater during this timeframe, with a powerful Soviet offensive opening in June 1944, two weeks before Operation Bagration smashed the German front lines in Belarus. The old Red Vengeance left off the Finnish theater, but now it’s included in its full four-hex-front glory. There are additional Soviet units for the front; one of the armies was already in the Red Vengeance mix, appearing later as a reinforcement on the main front. Now it can march there. Down on the Balkan end of the map, there’s a lot of room to do things that weren’t possible on the Red Vengeance map. There’s an option for Turkish intervention, since we have Turkish pieces in Defiant Russia that are still valid in the 1944 timeframe (at this scale, there’s not a huge amount of change in the capabilities of infantry corps/armies). Much like the situation in Defiant Russia, the Turks will only show up when the war is already won, this time by the Allies. Red Vengeance included not only the “Russian Front” (a Germanocentric phrase I’ve never liked), but also the last year of the campaign in Yugoslavia. The Yugoslavs are pretty tough, and the German occupation troops, well, they’re not. Defiant Russia’s map includes not only all of Yugoslavia, but also Greece, Albania and all of Bulgaria. So we now have the full scope of the war in the Balkans. For starters, Bulgaria gets its entire army; the Bulgarians contributed huge numbers of troops to the occupation of Greece and Yugoslavia. Once the Soviets reach Bulgaria, there’s a good chance that these troops will switch sides, though only some of them will march northward alongside the Red Army. The Allied cause picks up another revolutionary unit, the Albanian National Army. There is a Chetnik unit, which is just as likely to attack the Allies as it is the Axis. The Germans get to add another occupation corps, and the dubious assistance of the Croatian National Army. While a lot of Croats fought in the campaign, most were in units assigned to German corps, either National Army divisions or the German-officered “legionary” units. So there’s just one weak Croat unit included. The Greeks get no maneuver units – they did not form conventional formations like the Yugoslavs – but do get two partisans, one communist and one royalist. These two do not like one another. Late in the game a British corps lands in Greece; by that point the Germans need to be far away. There are very few units on either side to cover a fairly large territory, which makes this game-within-a-game a very limited engagement. There’s an option that changes that. Operation Zeppelin II was a deception: an Allied plan for an invasion of the Balkans, undertaken mostly by “notional” units that did not actually exist beyond a small cadre of radio operators faking their movements. Red Victory includes an option that makes this fake operation a real one: American, Polish, Canadian, British and Indian troops can land anywhere from Istria (the northern end of the Yugoslav coast) to Greece, and try to seize objectives before the Red Army can get there. The Allied invasion of the Balkans adds a great deal of chaos to the game, exactly as Winston Churchill, its great patron, intended. The Red Army can’t fight them within the bounds of the game, and must race them to get to key cities. The German Army can’t fight them either; according to the game rules they can, but the powerful Western Allied corps with their plenteous armored support will simply flatten the weak German occupation troops. As with the rebuild of Defiant Russia, I also added a bunch of optional variants because I felt like it: more Soviet leaders, a Soviet river flotilla, the German Baltic Fleet. And you can optionally go with starting German forces that I believe are much closer to the historical reality, but in game terms the Red Army is going to roll right over them. I wanted Red Victory to double the play value of Defiant Russia, and even with all the extras we crammed into the new Defiant Russia I think it does that. I do sort of regret not breaking it off into its own stand-alone boxed game, but presented this way it does give players a lot of value for their money. Mike Bennighof is president of Avalanche Press and holds a doctorate in history from Emory University. A Fulbright Scholar and award-winning journalist, he has published over 100 books, games and articles on historical subjects. He lives in Birmingham, Alabama with his wife, three children and his dog, Leopold. Leopold does not growl.